A look back at Philip Raby’s first drive in a Porsche 996 Turbo, back in 2004. If you asked your Mr Spocks and Hal 9000s what the best car in the world was, they’d come up with something sensible like a diesel-powered Vauxhall Zafira. A vehicle that would stolidly go about its business of transporting yourself, your family and stacks of cargo from A to B; cheaply and reliably. It would, in short, do everything a car needs to do in a very efficient manner. These logisticians would be wrong, of course; motoring should be about passion, not practicality. The best car in the world is the 996-model 911 Turbo. This is a car that rewrites the rulebook when it comes to performance, handling, safety and, well, driving enjoyment. It is just so good at everything it does. In fact, you could argue that it’s rather too good. There are very few places in the UK – if not the world – that you can exploit the 911 Turbo’s full potential. But that doesn’t stop me trying. 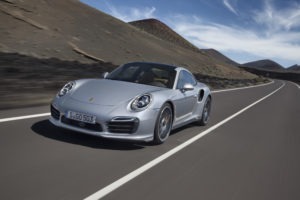 Porsche claims a top speed of 190mph which I’m certainly not going to attempt on the public road, but what’s far more fun than top speed is getting there – acceleration in other words. And the 911 Turbo gets there remarkably swiftly, with 62mph arriving in 4.2 seconds and 100mph in – wait for it – 9.2 seconds. Those figures only tell part of the story, though; you have to experience the performance to believe it. Floor the throttle (something you rarely get the chance to do with this car) and the rear-mounted, 420bhp, water-cooled engine catapults me forwards. As I’m pressed back into the leather-clad seat, I flick quickly from first to second as the red line is hit (the electronic rev limiter means you don’t suddenly lose power at the red line), and then into third gear. The passing hedgerows are a blur as the digital speedometer gives up trying and resorts to counting up in five mile-per-hour increments. And this is the scary thing – I’m now travelling at well over 100mph without even realising it. Not only did the 996 Turbo get me here astonishingly quickly (I didn’t time it, but that 9.2-second figure seems quite realistic) but also with the minimum of fuss and with none of that on/off turbo boost of older cars. At no point did I feel out of control as I was thrown into licence-losing territory. And now I’m there, the car feels stable, safe and if I wasn’t about to run out of road – and I didn’t value my licence – could quite happily continue accelerating to truly stratospheric speeds. As it is, though, I ease off the throttle to negotiate some upcoming bends. Although, if the truth be known, the Turbo’s finely balanced chassis would probably make mincemeat of the corners at far higher speeds than I’m prepared to try. Being a cautious bloke I take the first bend (relatively) slowly and accelerate out of it. Wow! Let’s try that again. At the next corner I’m more ambitious and enter it much faster and exit faster still. No problems; the firm but supple suspension and massive tyres take it all in their stride. I don’t even have to try. What I do have to concentrate on, though, is the road ahead. The 996 Turbo may be good, but at these speeds, it’s down to me to look well ahead for potential hazards. There’s a car winding along the narrow road towards me so I hit the brakes. Their stopping power is just as impressive as the car’s acceleration, and I’m pushed forward against the seatbelt as the massive red calipers bring me back to normality. I’ve hit some traffic now but the Turbo is just as happy tootling along as it is at hyperspeeds. Unlike some high-performance cars, this one is very easy to drive. The clutch, gearbox and steering all take delight in making your life as simple as possible, while the all-leather interior with its climate control makes a most agreeable cocoon from the cold, damp weather outside. I’m frustrated, though, being stuck behind lesser machinery and, as soon as I spot a gap, I drop down to second, flick the wheel to the right and just dab the throttle (like I said, full acceleration is rarely needed). That’s it, I’m past and ready to have some more fun. Eventually, all good things come to an end, and I come to a stop to give the car (and, more importantly, perhaps, me) a break. As the projectile sits there, its engine ticking-ticking as it cools, and the brakes emitting that unmistakable smell of hot pads, I reflect on what an amazing machine this is. Is it too good? I ask myself. Is it like playing GT2 in ‘Easy’ mode on the PlayStation? Well, yes, maybe it is. An average driver on average roads can drive a 996 Turbo at very high speeds in comparative safety. But that, surely, has to be a good thing. The wayward handling of earlier 911 Turbos became legendary for catching out inexperienced and unwary drivers, but that element has been genetically removed from this generation. Oh yes, owners of these older cars are going to bemoan the fact that the Turbo has lost its character. Lost what makes a 911 a 911. Maybe that’s true, but I’d rather say this latest incarnation has redefined what a 911 is. Moved the goalposts, upped the ante, sent the opposition back to the drawing board. Call it what you like, but if Porsche hadn’t made the 996 Turbo supremely great, than I’m sure it would have faced even greater criticism. If you like your 911s to be raw, then buy a 996 GT3, which gives you the pure, unsullied, rear-wheel-drive 911 experience in bucketfuls. And very good it is, too. Here, though, we have a very different car. A more sophisticated and forgiving car, with four-wheel-drive and PSM (Porsche Stability Management) to step in and give you a helping hand if things all get too much. The GT3 is a car to be a hooligan in, whereas the 996 Turbo allows you to traverse long distances at high speed and in safety and comfort, while having a great deal of fun at the same time. The Turbo’s not perfect, though. Close, but not quite there. The engine sounds like a demented Dyson and could certainly do with singing lessons from either the GT3 or one of its illustrious forebears. 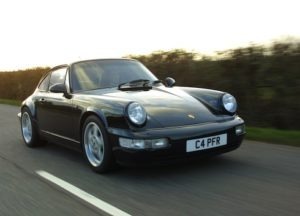 And, despite costing the thick end of £90,000, the car’s clearly been built to a budget; gone is the hewn-from-stone build quality of 911s of old. 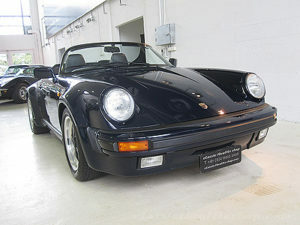 What’s more, the interior is let down by some cheap-looking black plastic trim, but is beautifully styled. On the plus side, the 996 Turbo is highly speccd and there are enough airbags to raise the Titanic and Litronic headlamps that are bright enough to illuminate the Moon. What’s more, it’s eminently practical. Not to the extent of the aforementioned Zafira, granted, but there’s enough luggage space for a weekend away, and the back seats will accommodate two children for long runs or a supple adult for a short journey. It’s a good-looking car, too. While the standard 996 has been criticised for appearing somewhat bland, the Turbo really does look the part with its aggressive front air intakes, wide rear arches with additional intakes, and fixed rear spoiler with its raising section. This brings us to another factor. The 996 Turbo is not just about performance, it’s also a car that makes a statement. It’s the automotive equivalent of power dressing. Driving this car makes you feel important, successful and, well, like you’ve made it in life. And that’s something it’s impossible to quantify and put onto a specification table. I simply love the latest 996 Turbo. OK, so the GT3 is more fun to drive, but the Turbo is the more complete car and, if I had to choose between them for everyday use, it’s the 911 Turbo I’d have in my garage. It is, after all, the best car in the world. What about from a 2017 perspective? I wrote the feature above back in 2004, says Philip Raby. In the years since, I have driven countless 996 Turbos and, of course, the 997 and 991 Turbos that came after. And do you know what? I have grown to love the 996 Turbo even more. Yes, the 997 Turbo offers a more involving drive and the 991 Turbo is more refined, but there is something 996 Turbo. It’s understated, has a great looking interior (I prefer it to the boxy 997’s), and offers phenomenal performance for sensible money. Plus, it’s practical, useable and easy to live with on a daily basis. I’ve even got used to the exhaust note! Front: MacPherson struts, longitudinal arms, twin-sleeve gas-pressure dampers.